Browse our luxury 30A Beach Rentals Below and BOOK your Emerald Coast Vacation Today! 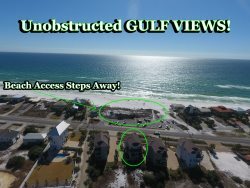 '1660 #302'South Side 30A Luxury Condo with Gulf Views in Heart of Watercolor + FREE BIKES! 30A Escapes 'Sans Souci' Pet Friendly Seacrest Beach Close to Beach and Pool! 30A Rosemary Beach Vacation Rental House 'Camellia Cottage' + FREE BIKES + 4 POOLS! 'Emerald Escape' Luxury 30A Vacation Rental House Directly on Lagoon Pool + FREE BIKES!